Sake (nihonshu) is arguably Japan’s most famous drink but in recent years it has been usurped by an unlikely contender: Shochu. Shochu is a distilled alcoholic beverage which has seen a huge growth in popularity in Japan and is also starting to make waves in Australia and other countries feeling the “Japanese Cuisine Boom”. While there are some similarities to sake, it is quite different in a number of ways. Shochu is essentially made with koji, yeast, water and then another ingredient that will define its character such as barley, potato, rice, buckwheat, brown sugar and dates. There are others but these are the main ones you’d come across, particularly barley and potato. Being a distilled spirit the alcohol level is higher than sake at around 25%. Many people refer to it as Japanese vodka but it differs strongly from vodka in that most shochu is only distilled once (in the case of honkaku shochu) to retain the essence and flavor of the ingredients whereas vodka will be distilled multiple times to produce a neutral, clean flavour . So basically shochu starts similar to sake in that a koji mould (white in the case of shochu, yellow for sake) is used for saccharification ie. conversion of starch enzymes into sugars needed to convert into alcohol. The mould is cultivated onto washed and steamed rice (or occasionally barley) and kept in humid conditions so the mould will propagate on the rice. It is then combined with water and yeast in a tank for its first fermentation which will take around five days. While this is going on the “key ingredient” is being prepared by washing and steaming to remove raw, green flavours (particularly with ingredients like potato). This ingredient is added to the mash (moromi) along with some more water and left for two weeks. Next the mash will be distilled in a wooden still. This will bring the alcohol level to around 30%. Finally the shochu will be left to mature for a period of anywhere from 60 days on before being cut with water to bring the alcohol level down a bit and finally bottled. A somewhat simplified explanation of shochu production but you get the gist. In the early 2000’s shochu burst onto Japan’s drinking scene after years in exile as a poor-mans drink or something grand-dad drank. With new laws clearly defining “honkaku” (authentic-artisan) shochu, Honkaku shochu was all the rage as shochu dedicated bars popped up all over the place. In fact shochu actually surpassed sake in sales for the first time in 2003. It proved particularly popular with women because of shochu’s apparent low-calorie count. Shochu became the “healthy” alcoholic drink. The cool thing about shochu is the different styles. Potato shochu (imo-jochu) tastes nothing like barley shochu (mugi-jochu) tastes nothing like rice shochu (kome-jochu). So it is kinda fun seeing if there is one you like. Many bars in Australia have picked up shochu as a new cocktail ingredient rather than let it shine in its natural state but hopefully drinkers will come round to see it for what it is rather than what it can be mixed with. You’ll find in Japan shochu is mostly drunk with water – cold or hot and with maybe a slice of lemon. It is also commonly mixed with oolong tea and also with fruit juices and/or fizzy soft drinks to make the popular chu-hai. Interestingly, around 90% of shochu production takes place on the southern island of Kyushu. Being a little warmer than the rest of Japan, Kyushu was never an easy place to make sake as fermentation for sake requires cooler temperatures. 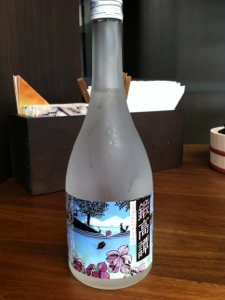 Rather than struggle with making sake, producers found shochu production to be much more viable. From Japan’s northern most island, Hokkaido. Tantakatan is ridiculously popular in Japan and can be found just about anywhere. Tantakatan is a barley based shochu infused with shiso (called perilla in English but I don’t find many people know what that is either!) a fragrant slightly bitter leaf. A clean style of shochu with a nice floral lift and some spiciness from the shiso. A refreshing style that works best cold on ice or with water. One of the most popular brands in Japan. Iichiko can be found everywhere. Aged for a year in oak. 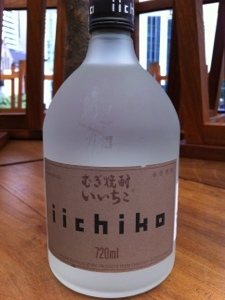 Iichiko is an excellent textbook example of flavourful shochu with typical mugi character. Clean, somewhat neutral with grainy hints. Works chilled, warmed, soda, on the rocks. A versatile shochu perfect for beginners to the shochu world. 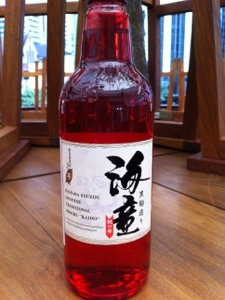 Posted on September 26, 2012, in sake and tagged iichiko, kaido, shochu, tantakatan. Bookmark the permalink. Leave a comment.